Finally your beloved daughter’s long-awaited birthday is here, and this is a great chance to show them how much you love! Make the celebration a truly joyful and memorable experience for her with the help of any of the following original birthday greetings we’ve taken our time to prepare for you. Happy birthday, daughter! May the Lord keep sadness away from your heart and worries away from your mind as you celebrate this beautiful day in your life. I am wishing the prettiest daughter in this world a truly awesome Big Day. May your day open the floodgates for good health, wisdom, fortune, and happiness in your world. I thank you so much for being the source of sunshine during my darkest moments. 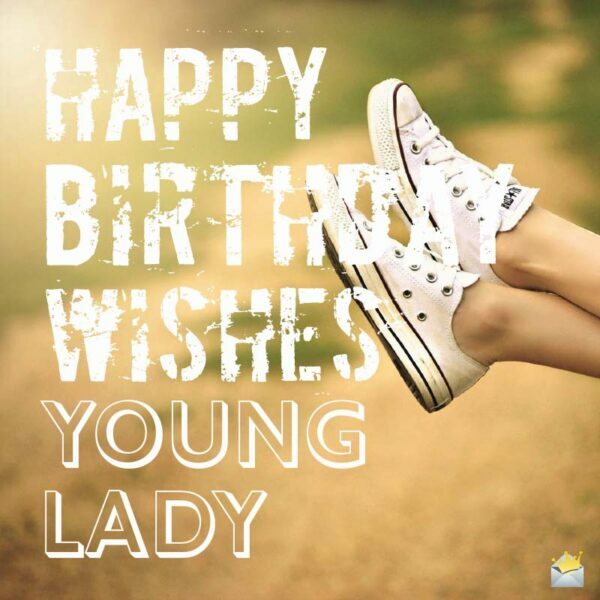 Wishing you a marvelous celebration, dear daughter! My very best wishes to the sweetest and loveliest princess in this universe! May your special day blossom with pure joy and excitement! 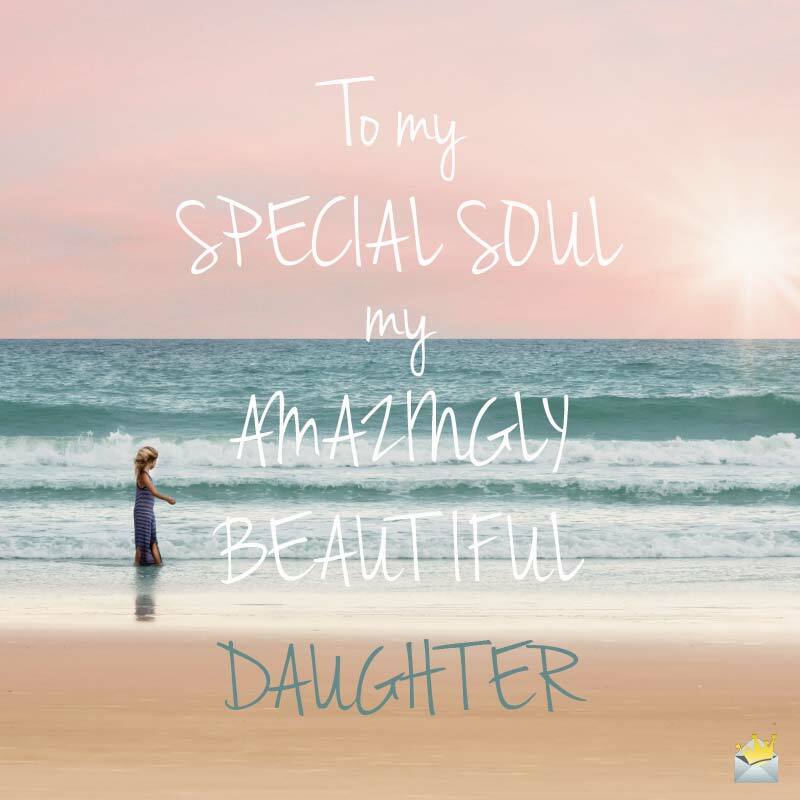 Dear daughter, I want to remind you that you are certainly the biggest blessing in my life, and I must also admit how proud and happy a parent you have made me. Today is the prettiest time of the year and I want to join you in commemorating this wonderful day which marks the moment you took your first breath on this earth. Happy birthday, daughter! I can’t hide the joy and gladness inside me as I join you in celebrating another incredible year in your life. Thank you, dear daughter, for making me a proud father/mother. Daughter, I want to thank you so very much for filling my heart with a huge sense of contentment, happiness, pleasure, and pride. Wishing you countless blessings on your Big Day! To my Special Soul, my Amazing Beautiful Daughter. My very best wishes to my pride and joy for a very spectacular birthday! Dearest daughter, you are so magnificent in every way and I can’t be more grateful to the Lord for you. Happy birthday, beloved daughter! You have made us the happiest and proudest parents with your captivating beauty and kindness. May you grow stronger, wiser and prettier each day. Happy birthday to an angelic daughter! Our prayer for you is that you will be blessed with fortune, good luck, and favor as you mark this special day graced our lives and this planet with your presence. Have a gladsome birthday, dearest daughter! You are indeed my greatest joy and pride. 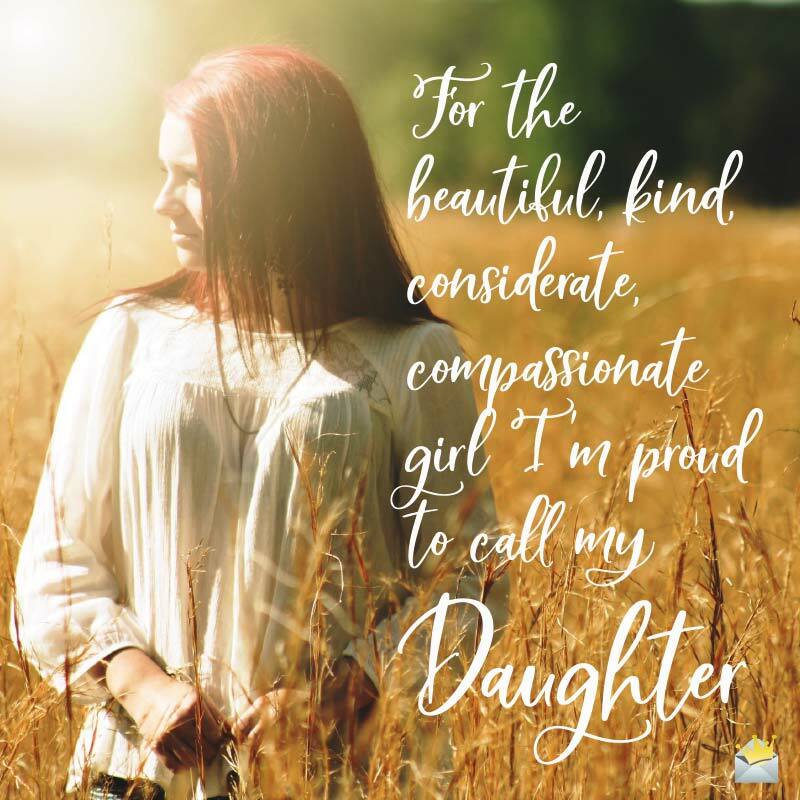 You have turned out to be the exact kind of daughter every parent will admire and wish to have. Thanks so much for always keeping us excited and proud. Wishing you a happy celebration! Happy birthday, lovely angel! May this anniversary bring forth a renewed hope and confidence that will forever keep you going! It is without a doubt that I am definitely the luckiest father/mother on this earth to have such a splendidly smart daughter like you. Happy birthday and wishing you tons of excitement! My warmest wishes to you for a truly joyous anniversary, beloved daughter! May the commemoration of your day of birth bring you so much excitement, fun, and many amazing opportunities! Happy birthday to an extra special daughter! You shine brighter than diamonds do, and I am sincerely proud and happy to be your parent. Daughter, I want you to know that every single minute that I get to spend with you brings me great moments of joy and gladness. Happy birthday, daughter! My biggest wish for you, dearest daughter, is that the celebration of this new age ushers many amazing moments and countless opportunities in your life. Happy anniversary! Happy birthday, daughter! You are an unbelievable blessing that the Lord has gifted to this family. We wish you a celebration that is just as stunning as you are. I am wishing you a very, very happy birthday, dear daughter! Thank you so much for bringing pure excitement and making my world such a colorful place to be. I love you! Dear daughter, I am hoping that on this magical moment, which marks your birthday, overflows with many exciting discoveries and joy that will remain with you forever. Happy birthday, dear! My heartfelt wishes for a lovely anniversary to a pretty and amazing daughter! I hope that you enjoy this outstanding day with so much joy and gladness in your heart. You are the most fantastic thing in my life and I pray that you enjoy your special moment with so much gladness and excitement. Wishing you all the love and happiness on your anniversary, dear daughter! Forget all negativity and think of a world that is filled with only joy and excitement as you enjoy this particularly awesome day in your life. Wishing you the happiest of birthdays, dearest daughter! Every day of my life is filled with testimonies and praises to the Lord and this is because He has blessed me with a stunning daughter like you. Wishing you a very splendid anniversary! Happy Big Day, dearest daughter! We are so very glad to be celebrating you today. We are also thankful to you for bringing fountains of joy and happiness into our lives. Happy birthday to our cute little princess! We are sincerely very grateful to you for sprinkling our world with unconditional love and joy. We love you in a truly precious way. To the beautiful, kind, considerate, compassionate girl I’m proud to call my daughter. This world has been so great and exciting since the first day I carried you in my arms, and today I am so very proud to celebrate that day together with you. Happy birthday, daughter! It is just so much of a privilege to call myself a parent of such an incredible person like you. Wishing you all the fun, excitement, and joy on this spectacular day of yours! Happy birthday, daughter! You are so important to this family and this is because you are glamorous, lovely, and kind. May all the days ahead in your life be endowed with immense happiness and peace. Happy anniversary, my special angel! Today is the celebration of your Big Day, and I wish you many awesome moments of true joy and prosperity that will last for eternity. Wishing my incredibly amazing daughter a truly supercalifragilisticexpialidocious birthday celebration! I love you so much, princess. You bring immense joy into my heart and brighten my day in such a splendid manner. Wishing you a hearty birthday, daughter!